For continuous cropper Dustin Sparrow, converting to a liquid injection system has resolved zinc deficiency issues on his Eyre Peninsula continuous cropping farm. Before investing in liquid injection equipment, applying trace elements was a case of too little too late for Wudinna grower Dustin Sparrow. The continuous cropper, who previously applied trace elements via boom spray, had noticed zinc deficiency in his wheat, barley and pea crops. “We used to apply our trace elements once the crop was tilling – mid to late tilling stage,” said Dustin. “Zinc was the main trace element that we were always putting on too late and we noticed a deficiency in the crops. We’ve been told that zinc should be applied at the two to three leaf stage and it was probably applied three to four weeks late. 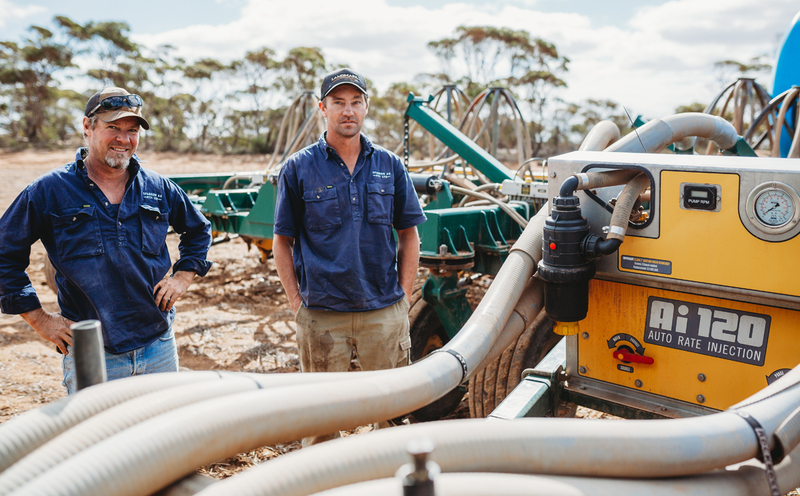 Dustin, who farms 3600ha with his wife Jodi on South Australia’s Eyre Peninsula, purchased a Liquid Systems Ai120 liquid injection system in January 2016 for the application of trace elements zinc, manganese and copper, plus the fungicide Flutriafol. He says the equipment’s simplicity allowed him to hit the ground running. The Sparrows use the Trimble 1000 with Field IQ crop input control system to operate the liquid equipment, which is installed on an 8-year-old Seed Master knife point machine. They are considering reducing trace element rates due to favourable soil tests, but in the first two seasons applied 2kg/ha of zinc sulphate, 3kg/ha of manganese mono and about 200g/ha of copper sulphate. For the 2018 season, the Sparrows switched to a copper oxide formulation as there had been settling issues with the previous copper product. They resolved this at the time by removing copper from some mixes. The Sparrows spent up to $30,000 on additional tanks and equipment, including a 7000L liquid tank that is fitted to the frame of their seeding bar, a 13,000L cartage tank and three storage tanks for each trace element. Dustin spends a day prior to seeding mixing the zinc and manganese using a cone bottom tank and four-inch pump. “I can mix all of my trace elements in one day without any trouble. During seeding, I do most of the carting and two workers drive the tractor. We keep up easily,” he said. The Sparrows apply between 40 to 60L/ha of liquid product and have found the rate control to be “spot on”. The Sparrows previously applied trace elements and herbicides in one pass via a boom sprayer and have since reduced their herbicide costs, as they can now choose cheaper herbicide formulations. Before they had to use a more expensive ester herbicide, as it mixed well with zinc. “We can use the cheaper 2,4-D amine formulations now, whereas we couldn’t before because it would block up the boom sprayer when mixed with zinc. The ester formulations were okay, but they’re at least double the cost of 2,4-D amine,” said Dustin. Above: A120 (126L/min) Pump & Control Module has been mounted on the bar. Above: L-R, Dustin Sparrow (Owner), Lyndon Kloeden and Paul Sargent. Above: 6 x “Stacker” manifolds are mounted on the bar, with 50 terminal outlets using friction tube assemblies.